Belgium is perfect for the novice cyclist with miles of flat, quiet country roads. 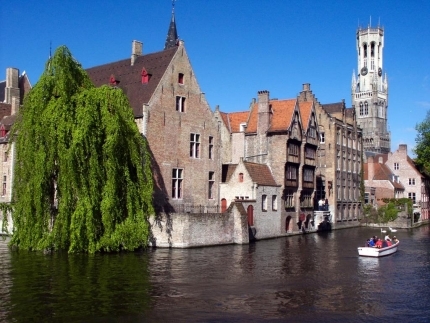 Enjoy seeing the country while either riding on dedicated bike trails or on the comfort of your barge as it moves along the many canals of Flanders. Belgium is both tiny and a place of distinct contrasts. The historic art cities of Dutch-speaking Flanders seduce visitors with medieval belfries, magical market squares and step-gabled houses overlooking pretty urban canals, all interspersed with superb museums and galleries. And they’re all close together, seamlessly interconnected by bicycle trails. Head out of the city and discover that Belgium is quite rural, with impressive caves, castles, wooded hills and bucolic valleys to explore. Cycling in Flanders offers a perfect combination activity and indulgence. Ride your bike and then treat yourself in the local flavours. Belgians serve up a remarkable range of edible specialties, including the world's most luscious chocolate. Jumbo mussels in a wine broth are served up with crispy, twice-fried frites. Then, of course, there’s the beer. Brewing is an almost mystical art in Belgium and many ales are still created in the traditional manner: in monasteries. Art, food, drink, bike trails, charming villages, all the ingredients to make an outstanding holiday.